The desired outcome of cancer vaccination is to induce a potent T cell response which can specifically recognize and eliminate autologous tumor cells in vivo. Accordingly, immunological assays that demonstrate recognition of native tumor cells (tumor-specific) may be more clinically relevant than assays that demonstrate recognition of tumor protein or peptide (antigen-specific). Towards this goal, we adapted the IFN-γ ELISPOT assay to measure immune responses against autologous primary tumor cells in vaccinated cancer patients. As a model system to develop the assay, we utilized peripheral blood mononuclear cells (PBMC) directly isolated from follicular lymphoma patients vaccinated with tumor-derived idiotype protein. After optimizing several variables, we demonstrated that the modified IFN-γ ELISPOT assay could be used to reliably and reproducibly determine the tumor-reactive T cell frequency in the PBMC of these patients. The precursor frequency of tumor-reactive T cells was significantly higher in the postvaccine PBMC, compared with prevaccine samples in all patients tested. Furthermore, the specificity of these T cells was established by the lack of reactivity against autologous normal B cells. These results demonstrate the feasibility of quantitating tumor-specific T cell responses when autologous, primary tumor cells are available as targets. Active specific immunotherapy is a promising but investigational modality in the management of cancer patients. Currently, several different cancer vaccine formulations such as peptides, proteins, antigen-pulsed dendritic cells, whole tumor cells, etc. in combination with various adjuvants and carriers are being evaluated in clinical trials [1–3]. To determine the optimal cancer vaccine strategy, a surrogate immunological end-point that correlates with clinical outcome needs to be defined since it would facilitate the rapid comparison of these various formulations. The clinical efficacy of cancer vaccines is likely to depend on several factors. Firstly, the induced T cells should recognize tumor antigens that are naturally processed and presented in the context of MHC class I and class II molecules on the surface of the tumor. Hence, an immunological assay that demonstrates recognition of native tumor (tumor-specific) may be a more clinically relevant assay to assess T cell responses following cancer vaccination, compared with assays that demonstrate recognition of tumor protein or peptide presented on appropriate antigen-presenting cells (antigen-specific). Secondly, the functional quality and the magnitude of the induced anti-tumor T cell responses are critical for the successful eradication of cancer. Therefore, it is conceivable that an immunological assay that directly measures both the function and frequency of the induced tumor-specific T cells could potentially serve as a surrogate end-point for cancer vaccine trials. Traditional immunological assays such as ELISA, proliferation and cytotoxicity assays can detect immune responses in vaccinated patients but are unable to quantitate individual reactive cells. In contrast, novel assays such as ELISPOT assay, intracellular cytokine assay and tetramer assay can quantitate the frequency of antigen-specific T cells. Of these, the ELISPOT assay is the most sensitive with a general limit of detection of 1 × 105 PBMC when tested with tumor antigens . The assay detects locally secreted cytokine molecules by means of antibody-coated membranes to capture the secreted cytokine derived from the productive interaction of the effector cell and its target cell. The assay has gained increasing popularity, especially as a surrogate measure for cytotoxic T lymphocyte (CTL) responses because it is simple, reliable, sensitive and quantitative [5, 6]. However, the ELISPOT assay has been primarily used for the detection of T cell responses against vaccine components by using peptide or protein pulsed antigen-presenting cells as surrogate T cell targets [7–9]. Demonstration of reactivity to vaccine components does not necessarily equate to recognition and elimination of tumor cells. Here, we report the development of a modified IFN-γ ELISPOT assay for the direct quantitation of T cell responses against autologous primary tumor cells. To develop the assay, we used follicular lymphoma patients vaccinated with tumor-derived idiotype (Id) protein as a model, since we have previously shown that Id vaccination induces tumor-specific T cell responses in these patients . After obtaining signed informed consent, patients with Stage III or IV follicular center cell lymphoma grade 1 or grade 2 were enrolled on this investigational review board-approved clinical trial. All patients underwent a lymph node biopsy prior to starting treatment to obtain tissue for vaccine production. The lymph node specimen was processed into a single cell suspension and cryopreserved. Patients were initially treated uniformly with a chemotherapy regimen as described previously . Tumor immunoglobulin protein, Id, was isolated from each patient's tumor by heterohybridoma fusion . The appropriate fusions were identified by comparing the Ig VH CDR3 sequences of the fusions with the patient's tumor. The Id was incorporated into liposomes along with recombinant human IL-2 as described previously . Each dose of the vaccine was formulated on a per ml basis with 2 mg of the patient-specific tumor-derived Id protein, 4 × 106 IU of recombinant human IL-2 and 160 mg of dimyristoylphosphatidylcholine lipid (DMPC, Biomira USA Inc., NJ) that was used to generate liposomes. Approximately six months after the completion of the chemotherapy, all patients were administered five doses of the vaccine subcutaneously at months 0, 1, 2, 3 and 5. Blood samples were obtained from patients at various time points before and after vaccination. Peripheral blood mononuclear cells (PBMC) were isolated by density gradient separation with Ficoll Isopaque (ICN Biomedicals Inc., Aurora, OH) and cryopreserved for immunological assays. Pre- and postvaccine PBMC were thawed, washed and resuspended to a concentration of 1–3 × 106 cells/ml in RPMI 1640 medium (Invitrogen Corp, Carlsbad, CA), supplemented with 5% FBS (Hyclone, Logan, Utah), 1 mM sodium pyruvate (BioWhittaker, Walkersville, MD), 20 mM HEPES buffer (Invitrogen), 50 μM β-mercaptoethanol (Sigma, St. Louis, MO), 2 mM L-glutamine, 100 U/ml penicillin and 100 μg/ml streptomycin (Invitrogen) (complete medium). Five ml of the cell suspensions were plated into each well of 6 well plates (Corning, Inc. Corning, NY) and rested overnight at 37°C, 5% CO2. The next day, PBMC were harvested, washed and cell viability was assessed by trypan blue prior to use in the ELISPOT assay. Cryopreserved cells from the lymph node biopsy specimen were enriched for tumor cells by depletion of T cells with CD3 microbeads over a magnetic column (Miltenyi Biotec, Auburn, CA) using the manufacturer's protocol. Autologous normal B cells were isolated from PBMC by magnetic cell separation method using the B Cell Isolation Kit (Miltenyi Biotec) according to the manufacturer's protocol. The purity of the isolated tumor and normal B cells was >95%. Tumor cells and normal B cells were activated for 3 days with 800 ng/ml of recombinant human soluble CD40 ligand trimer (sCD40Lt, Amgen, Thousand Oaks, CA) and recombinant human IL-4 (2 ng/ml) (Peprotech, Rocky Hill, NJ). Activated tumor cells and normal B cells were harvested and washed prior to co-culture with PBMC in the ELISPOT assay. MultiScreen-IP opaque 96-well plates (High Protein Binding Immobilon-P membrane, Millipore, Bedford, MA) were coated overnight at room temperature with 50 μl/well of 20 μg/ml mouse anti-human IFN-γ mAb (BioSource, Camarillo, CA) in DPBS (Invitrogen). After overnight incubation, the plates were washed three times with 200 μl DPBS/well and blocked with 200 μl/well of RPMI 1640, 10% human AB serum (Mediatech, Herndon, VA), 25 mM Hepes, 2 mM L-glutamine, 100 U/ml penicillin and 100 μg/ml streptomycin (Invitrogen) for 2 h at 37°C, 5% CO2. Harvested effectors were added to the plates in triplicates at 1 × 105 cells/well with either culture medium alone or with 2 × 105 cells/well sCD40Lt activated autologous tumor cells and cultured for 48 h at 37°C, 5% CO2. The plates were washed manually 6 times with 200 μl/well of DPBS/0.05% Tween. 50 μl/well of 2 μg/ml mouse anti-human IFN-γ-biotinylated mAb (BD Pharmingen, San Diego, Ca) in DPBS/1%BSA/0.05% Tween was added and the plates were incubated for 2 h at room temperature. Plates were manually washed 4 times with DPBS and 50 μl/well of streptavidin HRP (BD Pharmingen) diluted 1:2000 in DPBS/1% BSA was added for 1 h at room temperature. The plates were washed a final 4 times with DPBS. Spots were visualized by adding 100 μl/well of TrueBlue™ Peroxidase Substrate (KPL, Gaithersburg, MD) for 2 min. Plates were scanned and counted using the ImmunoSpot analyzer (Cellular Technology, Ltd., Cleveland, OH) to determine the number of spots/well. The precursor frequency of tumor-specific T cells was determined by subtracting the background spots in tumor alone and PBMC alone from the number of spots seen in response to tumor cells. Statistical analysis was performed using Student's t-test for paired mean values and Pearson correlation coefficient (R2). As a model system to develop a tumor IFN-γ ELISPOT assay, PBMC from follicular lymphoma patients vaccinated against an autologous tumor antigen (Id) were used as effectors, and primary autologous lymphoma tumor cells were used as targets. Several variables were evaluated to optimize the signal to noise ratio for the detection and quantitation of tumor-specific T cells. Table 1 summarizes the assay conditions that were tested and selected for the optimized autologous tumor IFN-γ ELISPOT assay. Variables that required optimization included type of microtiter plate, activation of tumor cells with sCD40Lt, freshly thawed versus overnight cultured PBMC, effector to target cell ratio, length of incubation time of the assay, culture medium, and finally, substrate detection system. Opaque and clear plastic versions of MultiScreen-IP ELISPOT plates were compared to facilitate optimal spot analysis using the ImmunoSpot analyzing system. The opaque version was most advantageous for ELISPOT enumeration. The opaque plastic precluded light-refraction from the reader's light source and therefore eliminated alterations in background color of individual wells that interfered with the ability to correctly enumerate spots. The ImmunoSpot analyzing system was able to auto-center opaque, but not the clear plastic plates, thereby facilitated automated analysis. Activation of B cell tumor cells with sCD40Lt upregulated various costimulatory molecules and MHC class I and class II molecules on the surface of tumor cells associated with enhanced antigen presenting capability [ and Neelapu et al., manuscript submitted]. Our pilot experiments indicated that activation of tumor cells with sCD40Lt markedly enhanced the sensitivity of the ELISPOT assay by increasing the IFN-γ production by responding T cells as compared to unmodified tumor cells (data not shown). We have therefore used sCD40Lt activated tumor cells as stimulators to evaluate T cell responses in this assay. To determine if resting in culture medium can improve the functional capacity of the cryopreserved effectors, we tested the reactivity of the PBMC against autologous tumor cells after resting them either overnight or for 2 h. Postvaccine PBMC showed markedly enhanced reactivity against autologous tumor cells after the longer rest period. Moreover, the precursor frequency of tumor-reactive T cells in the postvaccine sample was significantly higher than the prevaccine sample only after overnight resting (p < 0.05). The lack of significant difference in the number of IFN-γ spots in prevaccine PBMC between the two conditions suggested that the longer resting did not increase non-specific reactivity (Figure 1). Thus, these results implied that overnight resting of cryopreserved PBMC markedly improved our ability to detect tumor-reactive T cells by ELISPOT. Optimization of PBMC preparation for use in the tumor IFN-γ ELISPOT assay. 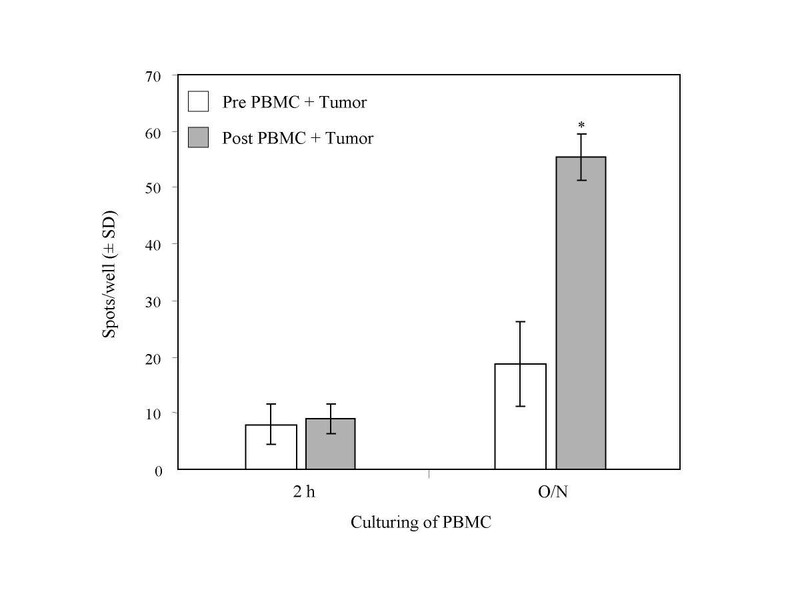 Cryoperserved PBMC were thawed and rested in culture medium either overnight (O/N) or for 2 h and assessed for optimal reactivity to tumor cells. Pre- (white columns) and postvaccine (grey columns) PBMC (1 × 105 cells/well) were co-cultured with sCD40Lt activated autologous tumor cells (2 × 105 cells/well) for 48 h in the ELISPOT assay. Significantly (p < 0.05) more IFN-γ production by responding T cells was observed in post- compared to prevaccine PBMC when PBMC were rested overnight. Data is presented as average number of spots per well ± SD and is representative of four experiments with similar results. To determine the optimal ratio of effector to tumor cells, a checkerboard titration was performed. Regardless of the effector to tumor ratio, the frequency of tumor-reactive T cells was greater in postvaccine compared to prevaccine samples. The best signal to noise ratio was achieved with effector cells at 1 × 105 per well and tumor cells at 2 × 105 per well (Figure 2). Although reactivity to tumor cells was observed in postvaccine samples at effector cell concentrations ≥2 × 105 per well, the resulting ELISPOTs were too numerous and/or diffuse to accurately enumerate the precursor frequency (data not shown). We have therefore used 1 × 105 effector cells stimulated with 2 × 105 tumor cells to evaluate T cell responses in this assay. Optimization of effector to target cell ratio for use in the tumor IFN-γ ELISPOT assay. 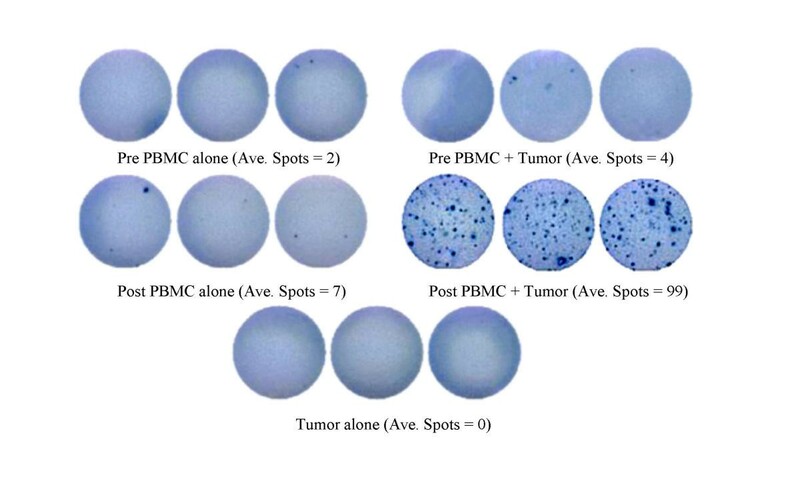 Various concentrations of pre- (white columns) and postvaccine (grey columns) PBMC (1 × 105, 2 × 105 or 3 × 105 cells/well) were co-cultured with different concentrations of sCD40Lt activated autologous tumor cells (1 × 105, 2 × 105 or 3 × 105 cells/well) for 48 h in the ELISPOT assay. Cryoperserved PBMC were thawed and cultured overnight. Data for PBMC concentrations of 3 × 105 and 2 × 105 cells/well are not shown because the resulting spots were too numerous and/or diffuse to count accurately. Significantly (p < 0.01) more IFN-γ production by responding T cells was observed in post- compared to prevaccine PBMC samples regardless of the effector to target ratio. Moreover, significantly (p < 0.01) more tumor specific T cells were enumerated at the 100:200 effector to target ratio compared to the other ratios tested. Data is presented as average number of spots per well ± SD and is representative of four experiments with similar results. IFN-γ is normally produced de novo and secreted between 24–72 h after T cells interact with appropriate targets. In our system, significantly (p < 0.05) more IFN-γ spots were observed in postvaccine compared to prevaccine PBMC samples regardless of the length of incubation. 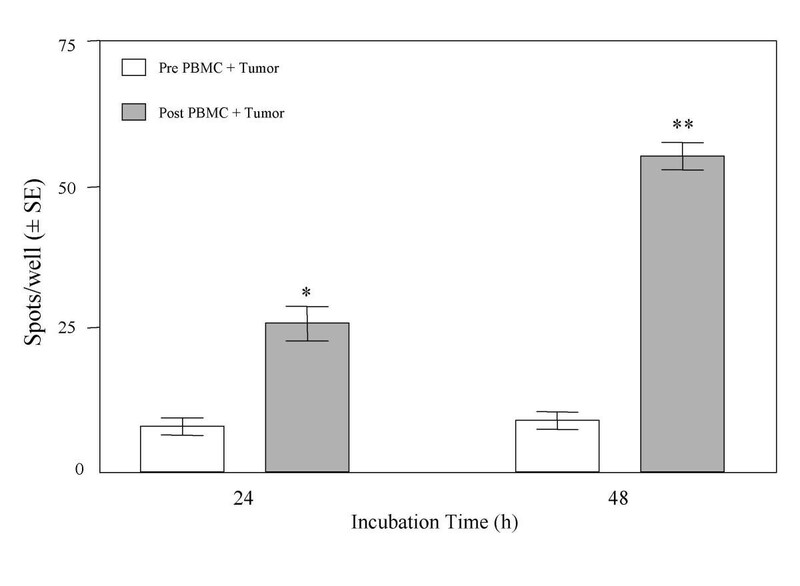 However, the longer incubation of 48 h detected significantly (p < 0.01) higher numbers of tumor-reactive T cells in the postvaccine sample (Figure 3). 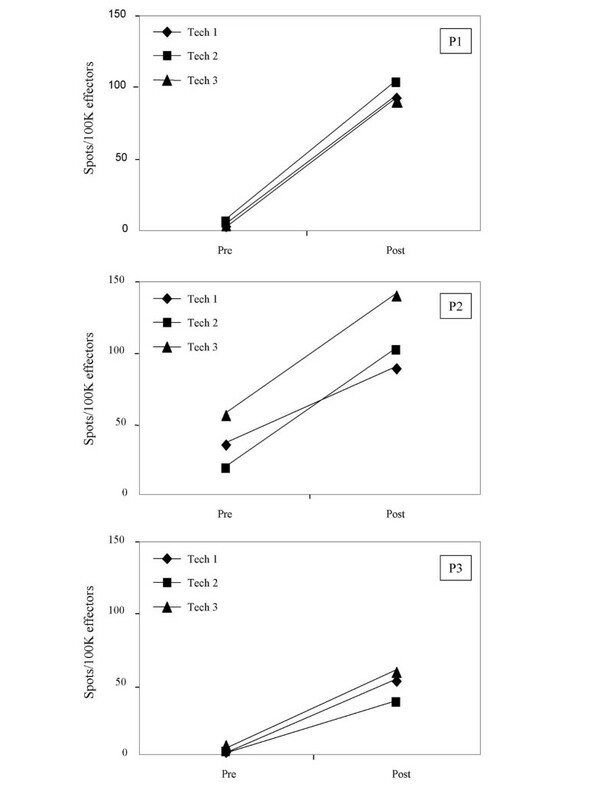 Further incubation (72 h) did not enhance the assay's ability to measure T cell responses (data not shown). The similar frequency of tumor-reactive T cells in prevaccine samples at both 24 and 48 h of incubation suggested that the longer incubation time did not increase non-specific activity. Incubation of PBMC and tumor cells for 48 h enhanced the sensitivity of the tumor IFN-γ ELISPOT assay. Pre- (white columns) and postvaccine (grey columns) PBMC (1 × 105 cells/well) were co-cultured with sCD40Lt activated autologous tumor cells (2 × 105 cells/well) for 24, 48 and 72 h in the ELISPOT assay. Significantly (p < 0.05) more IFN-γ production by responding T cells was observed in post- compared to prevaccine PBMC samples regardless of the length of incubation. Moreover, a significantly higher number of tumor-reactive T cells were observed at the 48 h in the postvaccine PBMC (p < 0.01). Data is represented as average number of spots per well ± SE (n = 3). Data for 72 h is not shown because the resulting spots were too numerous and/or diffuse to count accurately. Our previous studies suggested that the type of serum can influence the signal to noise ratio when analyzing antigen-specific T cell responses by various in vitro immunological assays. We have therefore tested media containing 5% or 10% HuAB serum and 5% or 10% FBS to determine the optimal sera for the tumor ELISPOT culture medium. The greatest frequency of the tumor-reactive T cells could be enumerated when medium containing 10% HuAB was utilized. 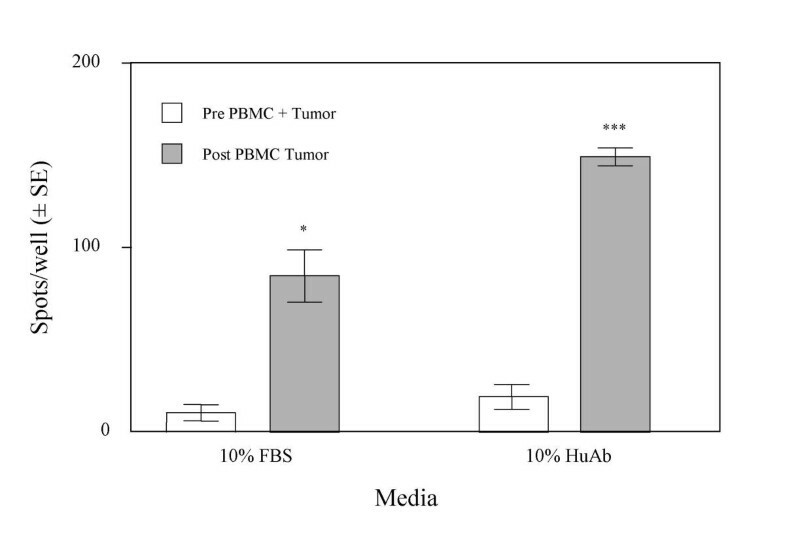 The 10% HuAB medium also yielded the most significant (p < 0.001) difference between pre- and postvaccine T cell reactivity to tumors (Figure 4). Regardless of the type of serum used, 10% media were superior to 5% media (data not shown). Medium containing HuAB serum enhanced the ability to measure tumor-reactive T cells. Pre- (white columns) and postvaccine (grey columns) PBMC (1 × 105 cells/well) were co-cultured with sCD40Lt activated autologous tumor cells (2 × 105 cells/well) for 48 h. The optimal media for the tumor IFN-γ ELISPOT assay was evaluated by comparing HuAB and FBS as the serum source. Although both HuAB and FBS containing media yielded significant (p < 0.001 and p < 0.05, respectively) differences between pre- and postvaccine T cell reactivity to tumors, medium containing HuAB yielded significantly (p < 0.05) more IFN-γ production. Several substrate detection systems were evaluated for spot quality and signal to noise (stimulated to unstimulated) ratio. Due to limited patient samples, the color development system was first tested and optimized using flu matrix peptide (FMP)-reactive PBMC from normal donors. PBMC (3 × 105 per well) alone and PBMC stimulated with FMP (5 μg/ml, NH2-G-I-L-G-F-V-F-T-L-COOH, American Peptide Company, Inc., Sunnyvale, CA) were utilized in the ELISPOT assay. After incubation for 24 h, spots were visualized using AEC (CALBIOCHEM, San Diego, CA), BCIP/NBT (KPL, Gaithersburg, MD) and TrueBlue™ (KPL) substrate detection systems according to the manufacturer's instructions. Extensive checkerboard titrations of the individual detection reagents (detecting antibody and substrate) were performed to optimize each system. The TrueBlue™ system was superior to AEC and BCIP/NBT in spot quality (Figure 5). The TrueBlue™ substrate was chosen as the optimal detecting system since it produced distinct spots with minimal non-specific staining of the plate membrane. 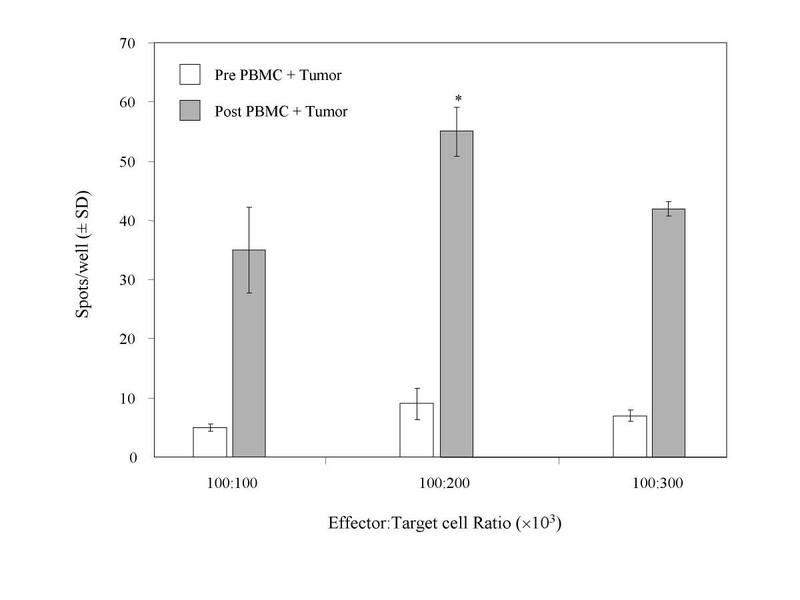 Similar results were observed when PBMC were tested against autologous tumor cells (Figure 6). Comparison of three different substrate detection systems for the tumor IFN-γ ELISPOT assay. The AEC, BCIP and TrueBlue™ substrate detection systems were evaluated for spot quality and signal to noise (stimulated to unstimulated) ratio using flu matrix peptide (FMP)-reactive PBMC from normal donors. PBMC (3 × 105 cells/well) alone and stimulated with FMP (5 μg/ml) were run in the ELISPOT assay for 24 hr. Spots were visualized using AEC, BCIP/NBT and TrueBlue™ substrate detection systems according to the manufacturer's instructions. Images from the plate scan generated by the ImmunoSpot analyzing system are shown. Data is represented as average number of spots per well ± SD. Representative wells of a tumor IFN-γ ELISPOT assay. Pre- and postvaccine PBMC (1 × 105 cells/well) were co-cultured with sCD40Lt activated autologous tumor cells (2 × 105 cells/well) for 48 h as described in Materials and Methods. Wells containing PBMC alone and tumor cells alone served as controls. Samples were tested blinded in triplicates. Images from the plate scan generated by the ImmunoSpot analyzing system are shown. Average numbers of spots per well are indicated. Data is from a representative experiment of nine with similar results. Based on preliminary testing, the protocol described in the materials and methods was established as optimal (Table 1). 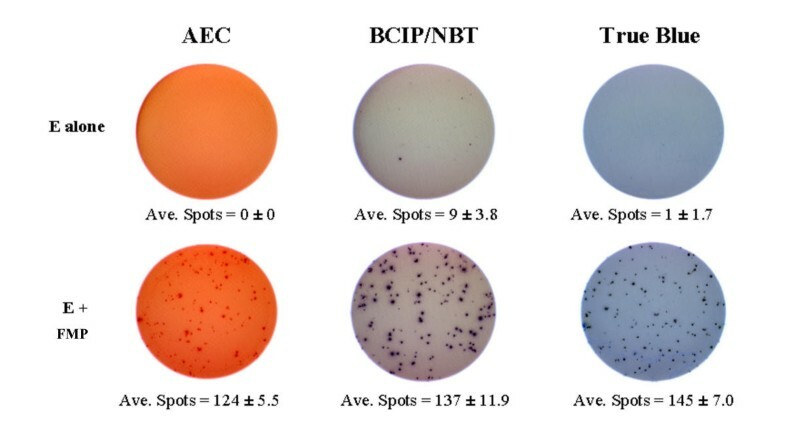 Triplicate wells demonstrating the IFN-γ spots produced by pre- and postvaccine PBMC analyzed in parallel from a representative patient are shown in Figure 6. A significantly higher number of IFN-γ spots were detected in the postvaccine PBMC as compared to the prevaccine sample (p < 0.001). The optimized assay could reliably detect the presence of tumor-reactive T cells in follicular lymphoma patients immunized with liposomal Id/IL-2 vaccine (Figure 7). The precursor frequency of the tumor-reactive T cells was significantly (p ≤ 0.001) higher in the postvaccine PBMC as compared to the prevaccine sample in all three patients. To assess the reproducibility of the tumor ELISPOT assay, the pre- and postvaccine PBMC samples from each of the above three patients were tested blinded in three independent experiments by three separate technicians. The results were very reproducible for all three patients with a Pearson correlation coefficient (R2) above 0.9 for all experiments (Figure 7). The results of the tumor ELISPOT assay for these three patients also correlated with the results of a cytokine induction assay when the IFN-γ level in the supernatant was measured by ELISA (data not shown). Reproducibility of the tumor IFN-γ ELISPOT assay. Pre- and postvaccine PBMC from three patients (P 1–3) were co-cultured with autologous sCD40Lt activated tumor cells for 48 h as described in Materials and Methods. All samples were tested blinded in three independent experiments by three technicians. The numbers of spots per 1 × 105 effectors were significantly (p ≤ 0.001) higher in the postvaccine as compared to the prevaccine samples for all three patients. For each patient the data is presented as spots per 1 × 105 effector cells. The correlation of the results between technicians was highly significant (R2 above 0.9 for all experiments). To test specificity of the T cell responses, postvaccine PBMC were co-cultured with either sCD40Lt activated autologous tumor cells or normal B cells in parallel. A significant number of IFN-γ spots were detected only in response to autologous tumor cells but not autologous normal B cells in all three patients that were tested (p < 0.001, Figure 8). Specificity of the tumor-reactive T cell responses. 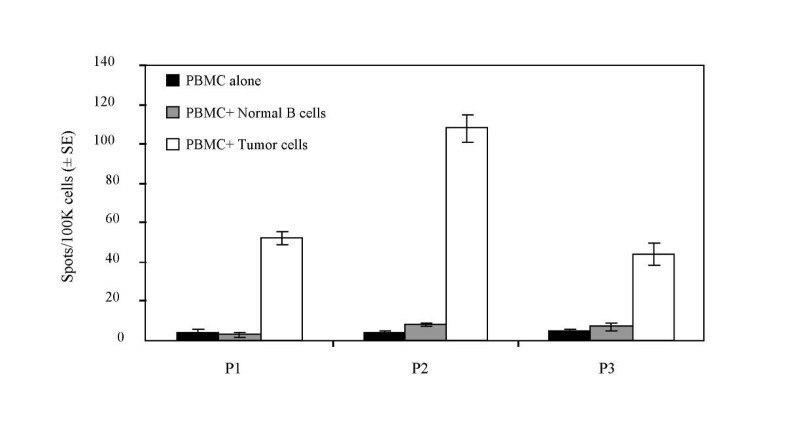 Postvaccine PBMC samples from three patients (P 1–3) were co-cultured with either autologous sCD40Lt activated follicular lymphoma tumor cells (white columns) or activated normal B cells (gray columns) for 48 h. PBMC alone are shown in black columns. All samples were tested blinded. Average number of spots per 1 × 105 PBMC ± SE (n = 3) are shown. Our data demonstrate that the ELISPOT assay could be easily adapted to reliably and reproducibly determine the precursor frequency of tumor-specific T cells in follicular lymphoma patients immunized with an autologous tumor-derived Id vaccine. We have also been able to use a modification (5 day tumor activation, 72 h incubation) of this assay to quantitate the tumor-specific T cell responses in mantle cell lymphoma patients vaccinated with Id (data not shown). Thus, this assay fulfilled our stated objectives for a clinically relevant immunological assay by demonstrating that it could functionally (IFN-γ production) and quantitatively assess the T cell responses induced by a cancer vaccine against autologous primary tumor cells. As opposed to the traditional antigen-specific assays that assess immune responses against vaccine components (peptides or proteins), tumor-specific immunological assays in addition to being more clinically relevant can have several advantages. Firstly, tumor-specific assays can potentially detect both CD4+ and CD8+ T cell responses since endogenous antigens are presented by both MHC class I molecules as well as MHC class II molecules [[13–15] and Neelapu et al., manuscript submitted]. In contrast, antigen-specific (protein) assays detect mostly CD4+ T cell responses since the soluble exogenous antigen is predominantly processed in the endosomal pathway and presented on MHC class II molecules. Secondly, tumor-specific assays can be used in patients with any HLA phenotype unlike peptide assays that are usually restricted to a single HLA phenotype (e.g. HLA-A*0201) depending on the binding affinity of the peptide. Thirdly, tumor-specific assays allow monitoring of patients when whole or lysed tumor cells are used as the immunogen and the tumor-specific antigens have not been defined. Finally, tumor recognition assays potentially enable the detection of immune responses against the immunogen as well as other antigens not represented in the vaccine. For instance, they can detect immune responses against cryptic epitopes that may develop by epitope spreading, secondary to the inflammatory response initiated by T cells specific against the immunogen [16, 17]. A probable limitation for tumor recognition assays is the availability of tumor cells. While primary tumor cells are easily accessible for some cancers (e.g. lymphoma, leukemia, myeloma, melanoma), they may not be generally accessible for certain other cancers (e.g. breast cancer, renal cell cancer). When available, it may be feasible to adapt the IFN-γ ELISPOT assay for the quantitative assessment of T cell responses against primary tumor cells as a preferable alternative to antigen-specific assays. Such quantitative tumor-specific immunological assays need to be eventually evaluated in large clinical trials to determine their validity as surrogate end-points for clinical efficacy of cancer vaccines. We adapted the IFN-γ ELISPOT assay to directly measure immune responses against autologous primary tumor cells in vaccinated cancer patients. We demonstrated that the modified IFN-γ ELISPOT assay could be used to reliably and reproducibly determine the tumor-reactive T cell frequency in the PBMC of these patients when sCD40Lt activated tumor cells were used as targets. The precursor frequency of tumor-reactive T cells was significantly higher in the postvaccine PBMC, compared with prevaccine samples in all patients tested. Furthermore, the specificity of these T cells was established by the lack of reactivity against autologous normal B cells. These results demonstrate the feasibility of quantitating tumor-specific T cell responses when autologous, primary tumor cells are available as targets. We thank Amgen for generously providing the sCD40Lt and Biomira USA Inc., for manufacturing the vaccine. Contract NO1-CO-12400 Funded by the National Cancer Institute. The Content of this publication does not necessarily reflect the views or policies of the Department of Health and Human Services, not does mention of trade names, commercial products, or organisations imply endorsement by the U.S Government. Collaborative research and development agreement with Biomira USA Inc, Cranbury, NJ. AM, LK and SN designed the study and drafted the manuscript. SS and KSW participated in the design of the study, performed the immunogical assays, analyzed the data and helped draft the manuscript. MB participated in the design of the study and served as an expert advisor. TU and AT performed the immunogical assays. All authors read and approved the final manuscript.